Attorney, Fraser & Souweidane, P.C. “We have used CORE Litigation as our exclusive court reporting firm for years. They are the most professional reporting firm we have ever utilized. Their transcripts are always precise and timely. Whenever we have a rush, they comply immediately. CORE is the go-to Litigation Support team in town, from court reporting to video needs to trial preparation. Turnaround is always prompt. Work product is top notch. And everyone is always friendly and accommodating. Highly Recommended. My firm has used CORE Litigation Support for trial presentations on many occasions. The turnaround time was amazing. The quality of work was also exceptional. I would have no hesitation recommending the services of CORE Litigation Support for any trial presentations. I’ve been in private practice for close to 30 years, and I have been extremely satisfied with all my litigation support services provided by CORE and David Newman. Thank you CORE and David for your 5-Star service! As an attorney who has been in practice for almost 30 years, I only trust CORE and David Newman for all my litigation support. From superior customer service to a polished end product, they have it all. 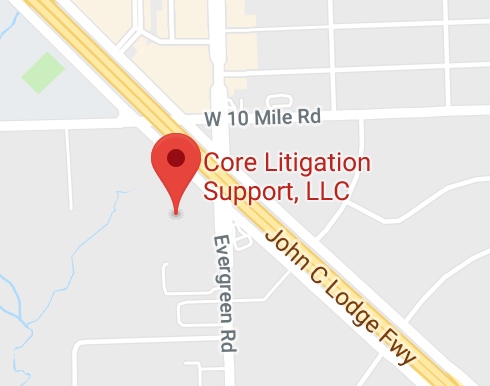 I strongly recommend CORE for your litigation support needs. Their court reporters are prompt, professional, and reliable. Turnaround time is quick and transcripts are very accurate. Further, their trial support is exceptional. Last-minute requests for trial boards are never a problem and their finished product is always on point. Rotter & Stone has been using CORE for many years as our #1 choice for litigation support in our divorce practice! When we call CORE, even at the last minute, they are ALWAYS responsive, professional and dependable. The answer is always yes! We never have to worry; and, in fact, we know the job will exceed our expectations. The turnaround time is excellent. Every single employee we have encountered has been top notch. We highly recommend CORE and David Newman! I have been a client of CORE for more than a decade. As an attorney specializing in personal injury and civil rights cases, trial presentation is key to winning for our clients. David Newman and his staff at CORE have proved to be valuable assets. From providing skilled video technicians to preparation of exhibits, CORE has always been reliable, timely, and professional. For any lawyer preparing a case for trial, I would not hesitate to recommend David and his team. Thank you for your continued support and excellent work product! Ready to take the CORE Path? At CORE, we have the team and the tools to help you become more productive and efficient. We call this The CORE Path.